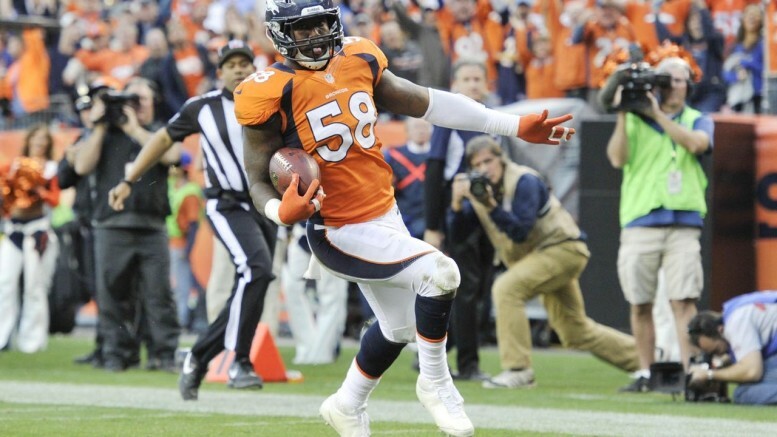 Von Miller, the Super Bowl 50 MVP, led a ferocious Broncos defense that neutralized the supposedly-unstoppable Panthers on Sunday. Yes, it’s over. It wasn’t all that close, either. The Denver Broncos are world champions for the third time in franchise history, and the Carolina Panthers came up empty in their second Super Bowl appearance. The 24-10 Denver victory was one that taught us plenty of lessons. Peyton Manning may have sold his soul to the devil early in his career; as a record-setting QB, the knock on him was that he couldn’t win the big one. In 2006, he scuffled all the way through, throwing three touchdowns and seven picks, yet won his first Lombardi trophy. He couldn’t win after a 600-point season by the Broncos in 2013, but in a 2015 campaign in which he threw nearly twice as many interceptions that TD passes, he emerged victorious on the big stage for the second time. Beyond the Manning arc, the Broncos defense kept up a trend that has become like clockwork: top defenses are virtually unflappable against top offenses in the Super Bowl. Though it wasn’t a matchup of top scoring offense vs. top scoring defense, this result was similar to the six previous meetings of top scoring units on Super Sunday. The defensive team prevailed for the on five of those six occasions. Let’s not forget either that the Broncos were not only used to the underdog status, but playing in close games. They set an NFL record (previously held by the 2003 Panthers, who we will discuss in a moment, and also the 1978 Oilers) by winning 11 games by seven points or less. They rarely got flustered. Carolina, meanwhile, went 15-1, winning the majority of their games convincingly. They let down recently in some second halves of games because they had built such big leads. Essentially, though they had proven themselves in a sense by beating Seattle and Arizona to reach the Super Bowl, they hadn’t been battle-tested in the way that Denver had. The Broncos did something no one had ever done, which is beat the Steelers and Patriots in back-to-back weeks in the playoffs in the 21st century. They beat the Patriots twice, only the fourth time in the Brady-Belichick era that’s happened in one year. All-world quarterback Cam Newton was flustered almost from the start, completing well under 50% of his passes and then not putting his body on the line trying to recover a critical late-game fumble. The Panthers were overhyped and underprepared for the speed and ferocity of Denver’s defense. By building themselves up in such a dominant manner, the Panthers became a bit of a lightning rod for fans who didn’t have a dog in this fight. Some were rooting hard for Newton to win his first ring, but others wanted to see the mercurial superstar fail. This year’s Carolina squad was a far cry from the other one in franchise history that reached the Super Bowl, the 2003 team. That group, led by John Fox (who of course was let go by the Broncos after last season) fought tooth-and-nail to fix the culture around the team that had developed after a nightmare 1-15 campaign in 2001. In his first season, Fox immediately turned the Panthers into a respectable team, and got them to the Super Bowl in year two. Those Panthers were likable not only because they were big underdogs against the big, bad Patriots in Super Bowl XXXVIII, but they also had a true underdog at quarterback. Jake Delhomme, a cast off from NFL Europe and the New Orleans Saints’ bench, took the league by storm in 2003. The Panthers found new and wild ways to win every week, pulling out a bevy of close wins and still getting no respect as the media and general public fawned over the Philadelphia Eagles and “Greatest Show on Turf” St. Louis Rams. Carolina won two road playoff games, including an instant-classic, double-overtime thriller in St. Louis, to reach the Super Bowl. In that game against New England, they put up as valiant an effort as you could without earning a win, a gutty effort that ended with an Adam Vinatieri field goal in the final seconds. What it all means is that Panthers club didn’t have nearly the talent of his one, but all the heart in the world, and it got them much closer to a world championship. Maybe this was the slice of humble pie Newton and the fun-loving Panthers needed; perhaps in the near future, whether it’s 2017 or beyond, it won’t be about being dominant and dusting the opposition, but about grinding out wins and learning how to close games when your back is pinned to the wall. As for Manning, who are any of us to tell a man when to retire? Still, it would be a crying shame if he didn’t take the opportunity to go out in this manner, with the perfect symmetry of winning the Super Bowl in his ninth season and — fittingly — his 18th. He also has exactly 200 wins, now the most all-time. Sure, he played this game and entire postseason as something of a “game manager,” but that’s not really as easy and unglamorous as it sounds. So much of playing the quarterback position involves not screwing up, and it is something of an art form. Putting up records galore never earned Manning a ring, so let’s give him credit for making this adjustment at the end of his career. Be the first to comment on "Super Bowl Recap: Lessons Learned From Broncos, 2003 Panthers"